While I’ve been on maternity leave I’ve really been enjoying going to the farmers’ market on Wednesday mornings. It’s something I normally can never do because I have to be at work. Big brother goes to parents’ day out on Wednesdays, so I drop him off and then head over to the market with the little one. The mid-week market is a lot less crowded than the Saturday market so it is very relaxing. I can push the stroller up and down the aisle perusing the veggies at my leisure. This past Wednesday the fall produce was really starting to come out. I picked up a butternut squash and some sweet potatoes. I also grabbed a zucchini and a couple of cucumbers. And at every stall there were beautiful bunches of fresh kale. They were so pretty I had to get one. I originally thought I would make Baltimorean style rice and beans with the kale but then I remembered that you can make pesto out of kale. Our basil plants have already gone to seed, a result of inattention due to a newborn, and I don’t have quite enough pesto stockpiled in the freezer for the off season. Kale is plentiful in the fall and kale pesto just might fill in the gap. I wasn’t sure of the proportions of ingredients as I was reading through it so I ended up using my old stand-by recipe and subbing kale for the basil. Here is the finished product tossed with pasta and cherry tomatoes from our garden. Bring a large pot of salted water to a full rolling boil. Meanwhile wash kale and trim the leaves from the large stems. Prepare a large bowl of ice water. Once water is boiling, blanch kale leaves in boiling water for approximately 30 seconds. Immediately place kale leaves in ice bath to stop the cooking. Lay kale leaves out on a towel and pat dry. With food processor running, add peeled garlic clove to finely chop. Add all remaining ingredients and process until combined, scraping sides of bowl as necessary. I found that I needed a couple extra drizzles of olive oil to get the pesto to the consistency I desired. The pesto turned out great! We all really enjoyed it, including the two year old. I wonder if kale pesto counts as a vegetable? Honestly though it mostly tastes like garlic, cheese and oil. Not that that’s a bad thing! I am planning on making a few more batches to freeze while kale is still in season this fall. 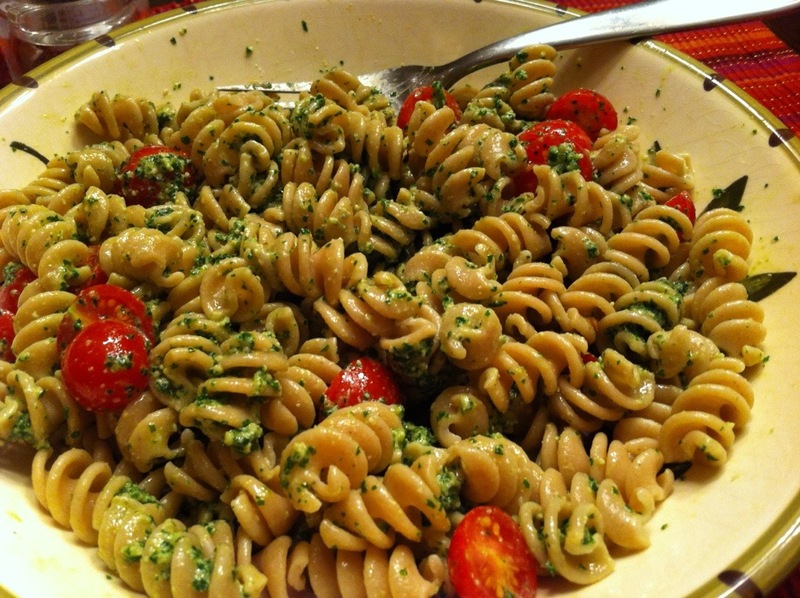 Pesto is so good on everything. In fact I’m considering making pesto egg sandwiches for breakfast this morning!